A cast floor is the perfect floor for your bathroom. The cast floor is seamless and fluid tight so you quiet and relaxing can showering, bathing and washing without having to worry about the floor. 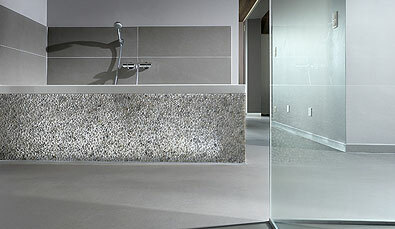 An aesthetic, practical cast floor in your bathroom cre undeniably creates a feeling of well-being and pleasure. We will be happy to advise you in choosing the right cast floor for your bathroom. The cast floors in our assortment offer sufficient opportunities to give your bathroom the correct modern look. 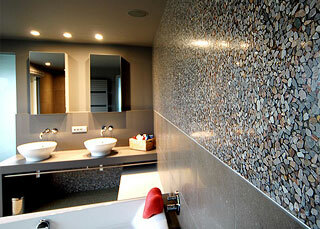 How about Stones Design wall panels in your bathroom in combination with a concrete look cast floor. In a cast concrete floor with a look in your bathroom, it is a cast floor finishing with a drawing or Ray. Pour concrete floors with a look be created by during the appliceren using two colors. For example, by two dark shades get to use your bathroom a modern warm appearance. Floor heating in your bathroom? A cast of vloelt warm floor itself but can also be very good to be used in combination with floor heating. Cast floors and floor heating go very well together. The low heat resistance of a cast floor that makes easy the warmth of the floor heating is by the cast floor passed. Our cast floor concrete look is infinitely many color combinations available to you in this cast floor close to perfect can at any bathroom Interior. The bathroom in the home takes an ever more prominent role to making a cast floor a pleasant tight addition for this space. Very easy to maintain and Serb hygi. The cast floor is for your bathroom to also work with a slip-resistant top layer. In addition, the color choice is to Zilly design floors are endless. For more information about a cast floor in your bathroom? If you want to know more about our cast floors, feel free to call us 0314-39 14 18 on our employees are happy to Word. For a price indication of cast floor in your bathroom a you can a quotewhole a non-binding.